It's been far too long since I've put together browsing tips, and the last collection I did focused on Microsoft Internet Explorer. So today I thought I'd serve up some tips for Mozilla Firefox and also share something I learned about Google's newsreader. A few days ago, the missus shoved some sheets of paper in my face and demanded, "Why are Web pages printing big all of a sudden?" Sure enough, all the print on all the pages was comically oversize--and largely useless, as much of the actual Web page was cut off on the right side. This was not good: My wife frequently prints recipes, and all this enlarged output was threatening our culinary happiness. So I fired up Firefox (her browser of choice), loaded up a recipe page, and clicked File, Print Preview. Basically, I wanted to see if the preview matched the actual output. Sure enough, it did, and here's why: The Scale setting had somehow gotten bumped to 150%. I changed it back to the almost-always-preferable setting Shrink to Fit, and presto: Normal print size restored. There's a very similar setting in Microsoft Internet Explorer, so if you're encountering weirdly sized text on your printed Web pages, make sure your "scales" are set properly. I'm not saying Firefox is ugly, but when it plays in the sandbox, the cat covers it up. Thank you, thank you, I'm here all week. Actually, I didn't realize just how gray and drab-looking Firefox was until I started fiddling with Personas 2.0. This new feature from Mozilla Labs lets you choose from thousands of themes with which to spruce up Firefox. Granted, the browser has supported themes for years, but those require downloading, installing, etc.--and in my experience, many of those themes are just overkill. Personas are more like window dressing: They add a splash of color and design to the menu/tab/toolbar area, but that's it. Even better, you get to see a live preview of any theme before installing it. 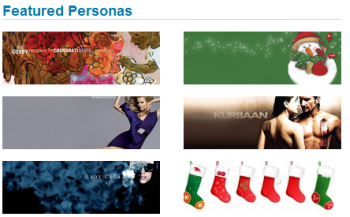 Just mouse over any theme in the Personas gallery, wait a second or two, and presto: It appears. You can do likewise in the Personas menu that gets added to Firefox under Tools, Personas. Reader Kevin has this question: "Is there a way to have Firefox refresh automatically, without hitting the refresh button? It would be very nice when Woot.com is having a 'Woot off' or when watching an item on eBay." You know what, Kevin? That would be nice! 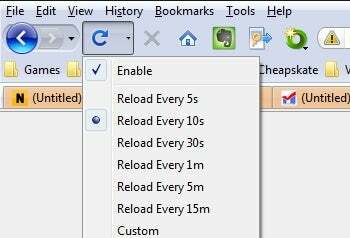 All you need is a handy Firefox extension called ReloadEvery, which can automatically reload a browser tab at designated intervals. Once you've installed it and restarted Firefox, just head to Woot (or whatever page you want to auto-refresh), then click the little arrow next to the Refresh button and choose your desired interval. Alternately, you can right-click anywhere on the page and choose ReloadEvery. The extension works on a per-tab basis, meaning you can choose different refresh rates for different sites. Just be careful not to use it with Web-based e-mail, forms, blog tools, and the like--otherwise you could lose some work in progress.